I am going to tell you right now that these cookies are EPIC. They start with fudge brownie cookies. 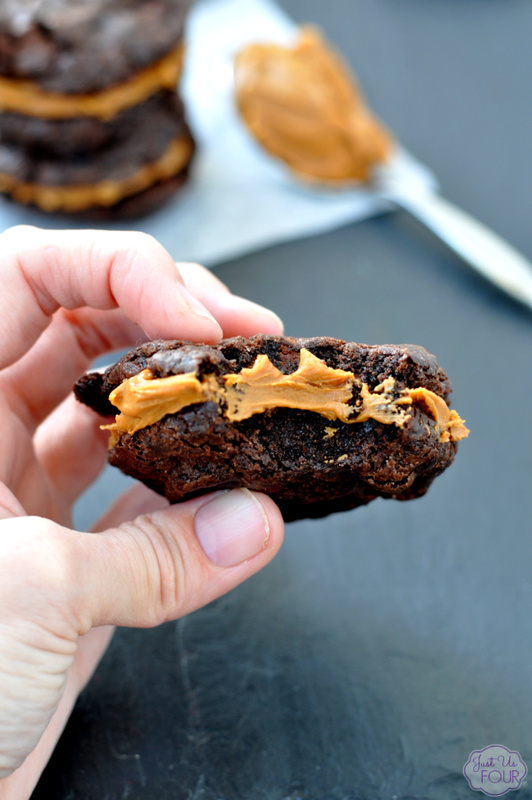 Then, cookie butter is sandwiched in between for the perfect addition. I won’t tell you how many I ate but let’s say my family didn’t get very many when they came home from school and work. If you’ve never had cookie butter, you need to fix that right now. Think peanut butter but made out of cookies! Yes, cookies. You can buy it or make your own (see below for a great recipe). It is great even just straight from the jar but I especially love it when combined with fudgy chocolate cookies. 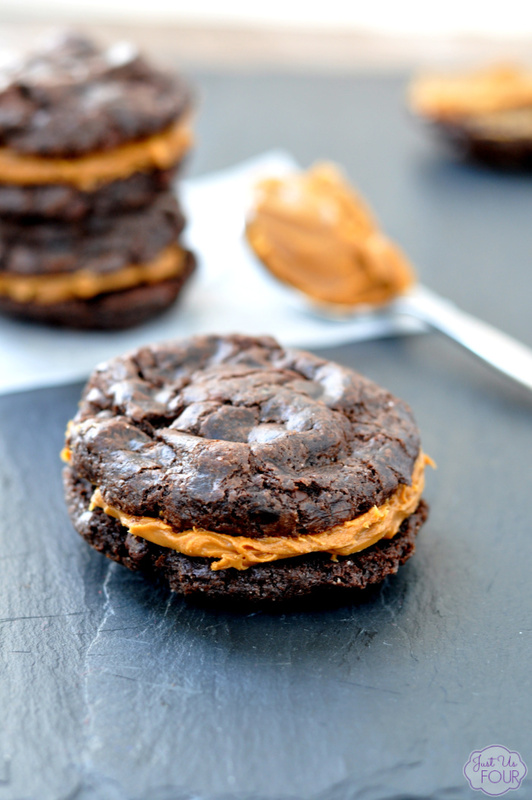 These cookie butter brownie sandwich cookies make the ultimate sinful dessert. 2) In a saucepan, over low heat, melt together butter and chocolate chips; stirring constantly until smooth. 3) Beat together eggs, sugar and vanilla extract. With mixer running, add in melted chocolate mixture. 4) In a small bowl, combine flour, salt and baking powder. Slowly add into chocolate and egg mixture; mixing until just combined. Fold in semi-sweet chocolate chips. 5) Drop by spoonfuls onto baking sheet lined with parchment paper. Bake for 10-12 minutes. Remove from oven and let cool. 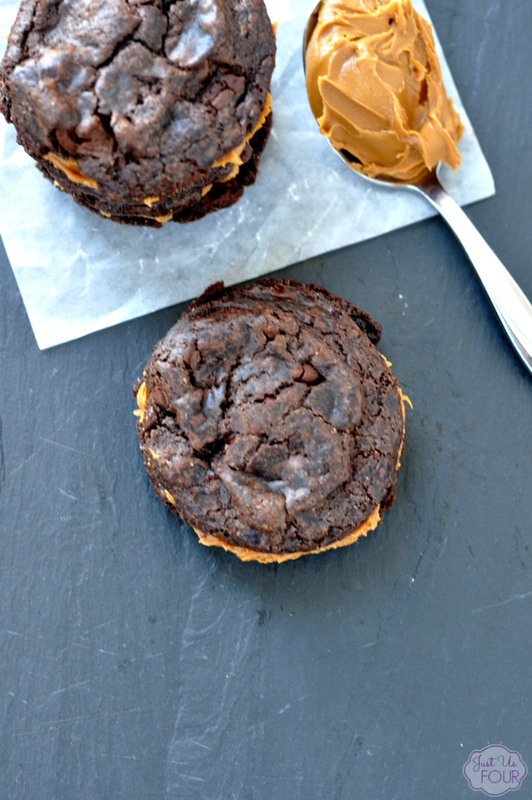 6) Spread cookie butter on bottom of cooled cookie and top with a second cookie. I am really speechless when trying to put into words exactly how amazing these cookies are. 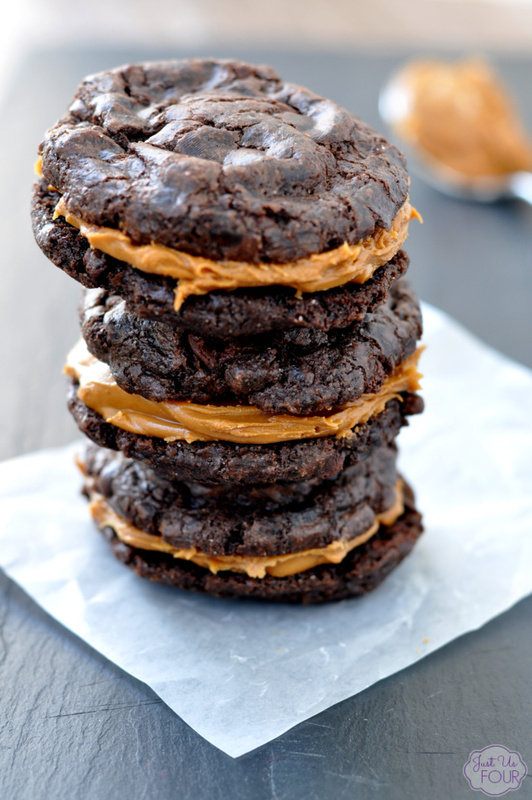 I mean they have it all…dark chocolate…cookie…cookie butter! You just have to go make them to see what I mean. What is your favorite way to enjoy cookie butter? If you try these cookies, be sure to let me know in the comments or share your experience with me on social media! 2. In a saucepan, over low heat, melt together butter and chocolate chips; stirring constantly until smooth. 3. Beat together eggs, sugar and vanilla extract. With mixer running, add in melted chocolate mixture. 4. In a small bowl, combine flour, salt and baking powder. Slowly add into chocolate and egg mixture; mixing until just combined. Fold in semi-sweet chocolate chips. 5. Drop by spoonfuls onto baking sheet lined with parchment paper. Bake for 10-12 minutes. Remove from oven and let cool. 6. Spread cookie butter on bottom of cooled cookie and top with a second cookie. You can find cookie butter at most grocery stores and Trader Joe's also has its own version. Yum! I haven’t tried cookie butter yet, but I hear only good things about it! Pretty sure my husband would love these. I have to try this recipe!! I hope he likes them. They are a big hit at our house. wo of my daughter’s favorite snack items put together, she’s going to love it. Found you from the Creative Gallery feature. I can’t get enough of cookie butter! Glad to hear someone else loves it as much as I do. Thanks so much for stopping by! I think I might be in love with these cookie sandwiches! Thanks so much for sharing this with us at Throwback Thursday! Ooooh these look delicious! What a treat, pinned for later!